Did you ever think you could play Black Jack or Gin Rummy while relaxing in the pool? How about playing solitaire while relaxing in the tub? 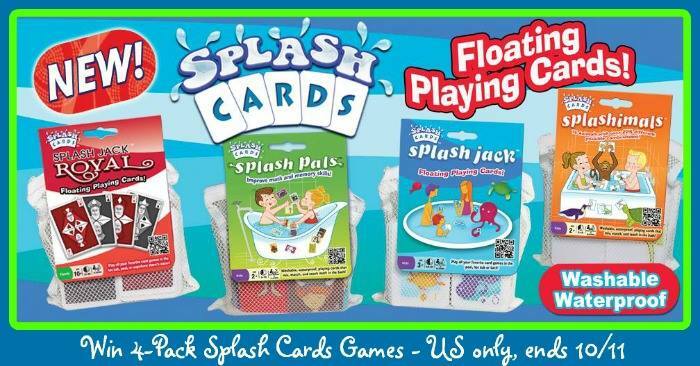 Splash Cards are a fun and amazing new toy that lets you play cards in the water! They have four varieties including Splash Jack Royal, Splash Pals, Splash Jack & Splashimals! We Heart Family and Friends is excited to be a part of this giveaway. Thanks to Winning Movies, It’s Free At Last and a group of amazing bloggers, one reader will have the chance to win all four sets of Splash Cards! Be sure to read this full review to see how fun and enjoyable these cards can be. One Lucky reader will win all four sets of Splash Card ($64 Value)! Giveaway ends Oct 11, 2014 at 11:59 pm ET! Open to US residents 18+ and older. This disclosure is done in accordance with the Federal Trade Commission 10 CFR, Part 255 Guides Concerning the Use of Endorsements. Entrants must only enter with either one email address, IP address and/or Facebook account, anyone found violating these rules will be disqualified. It is at the sole discretion of the admin of the giveaway if the winner has met the rules or not. We Heart Family and Friends is not responsible for prize fulfillment. I am most excited about Splash Jack. My sons would love Splash Jack and I would love Jack Royals.